our interest in bicycle riding. One thing led to another – strength, stamina, staying together – and we eventually bought a tandem bike – a bicycle built for two. I sat up front which made me the Captain. Barb rode behind which made her the Rear Admiral. With this new machine came a series of serious learning experiences, Those experiences are probably best left for other stories. The main thrust of this post is one of our travel quests. A book by William Least Heat Moon, River Horse, introduced me to tow paths. Moon’s quest was an inland watercourse from the Atlantic to the Pacific. It’s not that he recommended such a trip on a bike. It was his comment of a bicycle in a single paragraph. 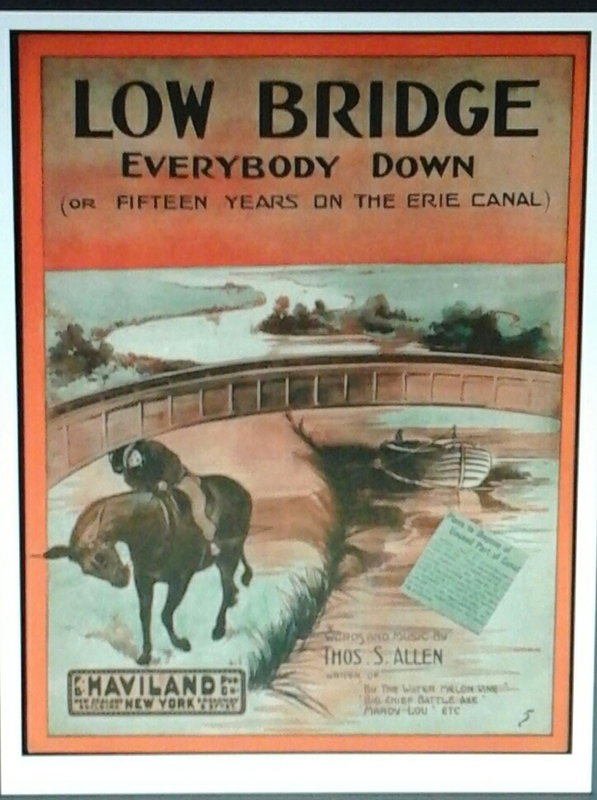 He was on the Erie Canal motoring westward. Progress was slow, waiting for locks to allow passage and other obstacles that have slipped my mind. These delays allowed him to gaze about and consider his situation. One thing that seemed to bother him was a lone bicycle rider pedaling along the tow path. Many times the bicycle passed him by. If the shores of the Pacific was this cyclist destination Moon feared he would most certainly lose the race. As a result of this paragraph we set our sites on pedaling the Erie Canal. And how I wish we could have pulled it off. But obstacles also blocked our progress – not slowing us down, but preventing us from going at all. My yearn for this adventure caused me to conduct a mountain of Erie research. The history, politics, financing, and effort making Clinton’s Ditch a reality was mind-boggling. In subsequent posts I shall address some of the numerous aspects I found worthy of passing along.